Thomson map focusing on the southwestern parts of Europe. [Europe after the Congress of Vienna]. This is an attractive 1817 map of southwestern Europe by the Edinburgh cartographer John Thomson. It depicts the whole or part of the modern day nations of Spain, Portugal, France, Italy, Switzerland, Austria, Germany, Belgium and Luxembourg. Rivers, mountains and other topographical features are noted. This map is a part of a Thomson’s larger 4 map set of Europe entitled ‘Europe after the Congress of Vienna’. The map was issued to depict the territories set by the Congress of Vienna in 1815, here depicted by color-coding. Following the defeat of Napoleonic France, the conference in Vienna set to resize the main powers so they could balance each other off and remain at peace. Europe under a new peaceful balance of power was centered on the five most important powers (also referred to as the five ‘Great Powers') of the United Kingdom, France, Russia, Prussia and the Austrian empire. Alas, the ‘peace' was but an illusion and Europe was anything but calm. Old rivalries would fester and soon nationalism, liberalism, revolution (industrial and otherwise) would once again be on the rise across Europe. Thomson's work, including this map, represents some of the finest cartographic art of the 19th century. His maps are known for their stunning color, awe-inspiring size, and magnificent detail. 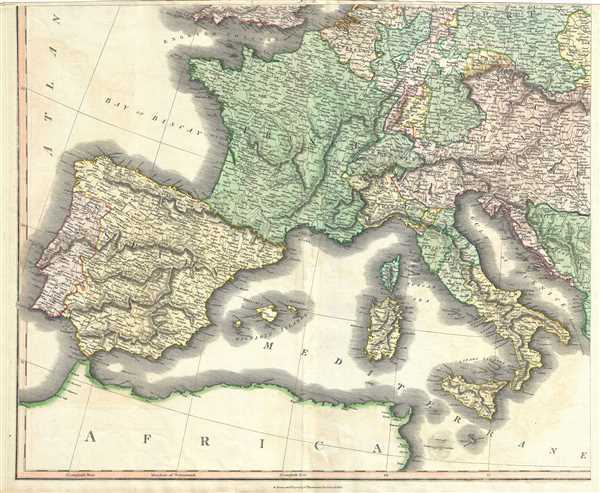 This map was prepared by John Thomson for inclusion in the 1817 edition of his New General Atlas. Very good. Minor wear along original centerfold. Minor toning and spotting. Narrow top margin. Minor offsetting.